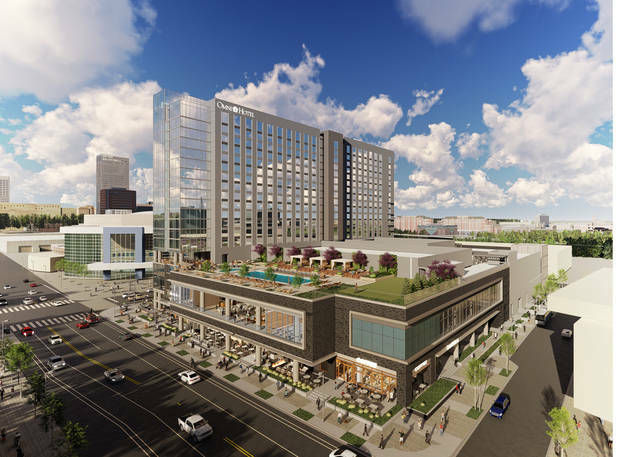 With construction set to start soon on the 18-story Oklahoma City Omni south of the Chesapeake Energy Arena, plans have advanced to the stage of requiring submission to the Downtown Design Review Committee, whose approval is a critical last step to filing for a building permit. First, recall this project has been in the works for the past year following negotiations between Omni and the city over public participation in the project, costs, scope requirements and discussions on how best to design a convention hotel that can best serve the new convention center, the future Scissortail Park and Chesapeake Energy Arena. 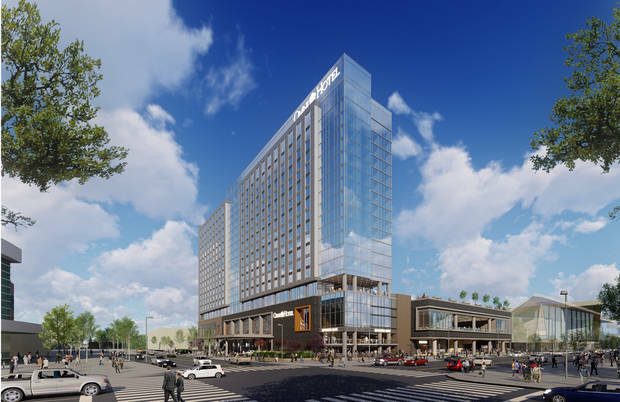 The deal approved last summer by the city council provides $85.4 million in public assistance toward construction of the $235 million hotel. 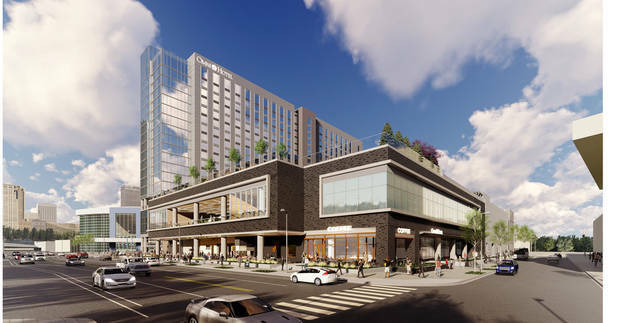 The city is also preparing to build a garage to the east of the hotel that may come with a mix of workforce house as part of the development. 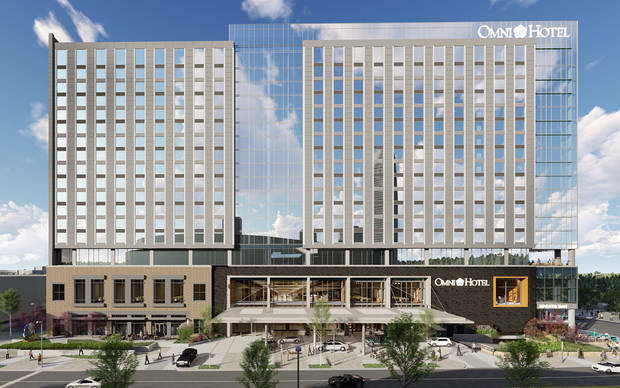 For the entirety of the 45-year agreement, the Omni would be the city&apos;s official and only “convention center hotel.”The city&apos;s contribution would come in a bond issue to be paid off with revenues from three existing downtown tax increment financing districts. The hotel would pay $200,000 a year for 25 years commencing the fifth year after completion. Other hotel revenues will include minimum annual tax payments of $1.4 million for 30 years. The hotel is required to meet the AAA four-diamond rating with three to five restaurants and retail at the ground floor. The plans coming out today show six restaurants and bars, including one smaller lobby bar and one small grab-and-go. I&apos;m not sure if we&apos;ve seen the address listed, but now we know the official address for the Omni will be 400 S Robinson Ave. Contractor: Brasfield & Gorrie, Kennesaw, Ga. Architect: Rule Joy Trammell + Rubio, Atlanta, Ga. Mechanical, electrical, plumbing engineer: Alvine Engineering, Omaha, Neb. So let’s start with the project summary provided by Craig Dupuis with Rule Joy Trammell + Rubio. The hotel will be 18 stories high, 605 rooms and the tower will front the Oklahoma City Boulevard. The entry level of the hotel contains the check-in lobby, lobby bar, specialty and full-service restaurants and retail space. A 6,195-square-foot entertainment bar anchors the northwest corner, with an open-air atrium connecting the first floor with a second, 3,500-square-foot mezzanine overlooking both the first floor and with patio dining overlooking Scissortail Park. The lobby faces north, along the Oklahoma City Boulevard. A second, smaller 971-square-foot lobby bar is located at the back end of the lobby. A 502-square-foot “grab & go” will be located to the east of the lobby. To the south of the entertainment bar, plans show a “specialty restaurant and bar that will dominate the frontage along Robinson Avenue across from Scissortail Park. A 1,982-square-foot coffee shop, meanwhile, anchors the southwest corner of the Omni, also across from the park. A hallway is shown connecting the coffee shop, restaurant and bar with a 2,054-square-foot retail space. The second floor will be home to all of the convention space, including grand and junior ballrooms, meeting rooms, a concierge and business center. A third level will include a fitness center spa, outdoor bar, deck and pool. The rooms will be located on the fourth through the 17th floors. 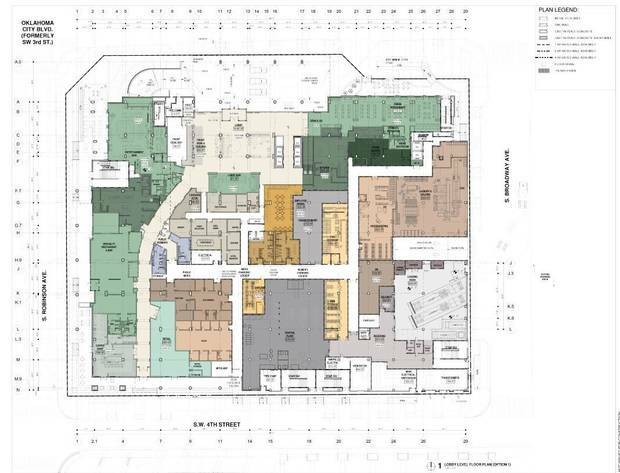 The plans indicate quite a few rooms (its difficult to figure out the count) on the 16th and 17th floors are being designed to accommodate NBA players. 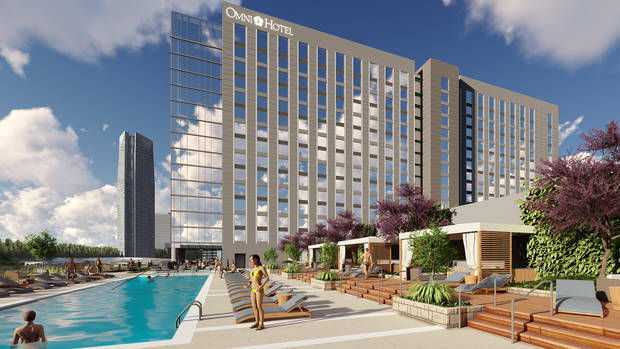 The Omni, convention center and Scissortail Park are all set to be completed by 2020.